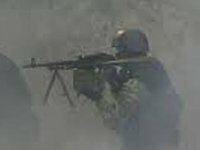 Ukrainian army positions came under 37 attacks in Donbas in the past 24 hours, the anti-terrorist operation (ATO) press center wrote on Facebook on Thursday morning. In the Mariupol sector, Ukrainian positions were attacked with large-caliber machineguns and various types of grenade launchers in Maryinka, Krasnohorivka, Novotroitske, Taramchuk and Talakivka, while troops stationed near Berezove were bombarded by a ZU-23-2 anti-aircraft gun, the report said. Ukrainian strongholds near Novotroitske and Berezove were attacked with 120mm mortars from the southwestern outskirts of Dokuchayevsk at 10 p.m., the press center said. Fourteen attacks on Ukrainian strongholds were observed in the Donetsk sector. Large-caliber machineguns and various types of grenade launchers shelled Ukrainian strongholds near Troitske, Avdiyivka, Novhorodske and Zaitseve. Infantry combat vehicles and heavy mortars were engaged in shelling incidents near Luhanske. Snipers were active in the same area. Grenade launchers fired on Ukrainian positions near Novozvanivka in the Luhansk region.